The title “Porcelain Poetry” aptly describes Donna Arganbright’s work in clay. Her functional vases, bowls, mugs, plates and trays flow with soft lines and beautiful melted, blended glazes, bright against the white of the porcelain clay. Tall bamboo like vases in soft green tones, luscious blue trays, and vibrant red pitchers are some of her work you will see at the Moraga Art Gallery where she participates in this very active and beautiful co-op gallery. Donna enjoys creating pottery that her customers can take home, touch and use in their everyday lives. She is known for her Attitude Figures, functional vases that are disguised as posturing figures, hands on their hips, clothed in green, red, brown and tan glazes. With a studio facing out to a wonderful view of redwoods, gardens and California hills, Donna takes inspiration from the nature that surrounds her. Customers frequently note that she has an Asian inspired look to her pottery. Her work is constructed using a combination of the potter’s wheel, slab roller and extruder. 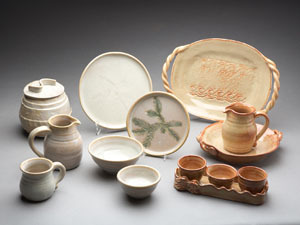 She likes to use a variety of approaches with porcelain so that she can combine the different techniques creating a piece that is fresh and new. She particularly likes to focus on the fluidity of the clay and tries to capture this in her work. Donna studied Art as an undergraduate and taught art at all grade levels for many years. Feeling that an Art Teacher should be an actively practicing artist, she decided to work in clay, a medium she had been drawn to as an undergraduate. Honing her skills, she worked with several master potters over the years. She works hard to keep her work fresh and changing and does accept commissions. Donna’s work is also shown at the Valley Art Gallery. She has exhibited at the Bedford Gallery in Walnut Creek, the Orinda Library, the Walnut Creek Library, has participated in the Lamorinda Arts Alliance Open Studios for many years, and has been a part of various fairs and festivals. Her work is included in many private collections. She is active on the local art scene and serves as President of the Lamorinda Arts Alliance. Here are more examples of Donna’s work.